ResCom was using Open Access, a DOS-based software program to keep track of work orders and invoicing. Because there was no integration with QuickBooks, the company was double entering data into QuickBooks as its employees created invoices in Open Access. This process became to manual and time consuming so ResCom looked for a simpler and more streamlined method for invoice creation and record keeping. One of the reasons that ResCom selected ServiceCEO was because the program was Windows-based. More importantly, the company liked ServiceCEO's ability to effectively track bid requests and schedule work repair teams, and its ability to export ResCom's financial data into QuickBooks. Creating invoices in ServiceCEO has created a huge time savings for ResCom due to the program's ability to integrate with QuickBooks. 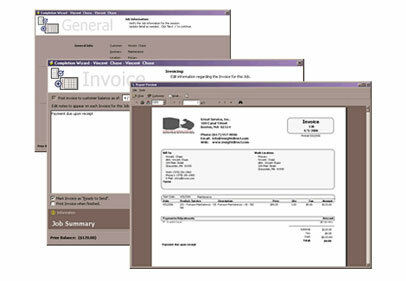 According to ResCom, invoices are also more professionally laid out than before due to the Crystal Report feature for designing the invoice layout. Overall, ServiceCEO saves ResCom about 3 man hours a day. The time savings and the increased productivity has meant that ResCom's administrative staff can focus on activities that have a greater impact on their top- and bottom-line.